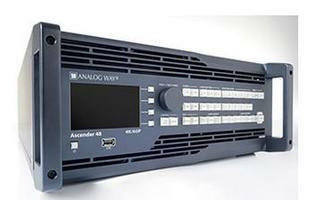 Analog Way is adding 4K resolution to its LiveCore series of AV switchers and will debut at InfoComm next month the Ascender 48-4K. Analog Way will add to the LiveCore series two new connectors: HDMI 1.4b and DVI 4K. Three HDMI 4K inputs and two DVI 4K outputs will be available on the SmartMatriX Ultra, Ascender 32 and Ascender 48. The NeXtage 16 will come with two HDMI 4K inputs and a DVI 4K output. Several frame rates are available as 4K/30P 4:4:4, 4K/60P 4:2:0 or 4K/60P 4:4:4 according to the reference. The LiveCore series supports 3840×2160 (UHD) and 4096×2160 resolutions (native resolution for DCI-compliant 4K). The option will be available for systems already in the field. Analog Way says the LiveCore series offers the ability to perfectly switch a 4K native background or 4K layers. When one output is disabled, its layers can be added to another output, resulting in up to 12 true seamless layers per output in 2K, or 6 layers in 4K.